No diapers were harmed during the making of your diaper cake! We are located just outside of New York, NY and have shipped thousands of diaper cakes all over the United States through the years. We take pride in each one and invite you to browse our large selection of beautiful new baby gifts. We offer $10 FLAT RATE GROUND SHIPPING per product quantity, on all orders. 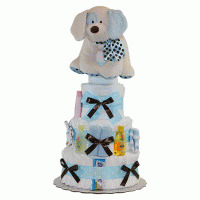 Each of our baby diaper cakes is made fresh when you place your order and so most of our Baby gifts. Orders are filled in the same sequence in which they are received. Please allow up to 10 business days for delivery to a PO Box. We do not ship internationally or to APO/FPO addresses at this time. Additional shipping charges will apply for orders shipped to Alaska & Hawaii. How long to my area? Please view Shipping info. under each specific item. If multiple items are ordered, they may ship from separate locations and may arrive at different times. Orders shipped within state of New York will be charged sales tax. We know that shopping on the web can be an uneasy experience. 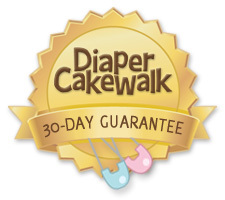 So we make you a promise - you can shop Diaper Cakewalk worry free...guaranteed. We are not just working to provide you with a practical new baby gift or unique baby shower gift - we are working to provide you with memories. A year from now your gift recipient won't remember who got them flowers or a baby blanket. But they will remember the clever diaper cake - and the thoughtful person who purchased it. But don't take our word for it. 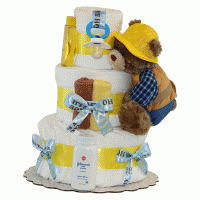 Order a diaper cake today and decide for yourself. 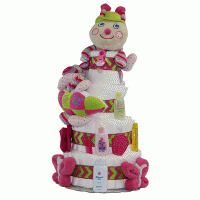 If you are not pleased, return the diaper cake to us within 30 days of purchase - and have your purchase price refunded, less shipping. PLEASE NOTE: Personalized Diaper Cakes and all other Gift items are NOT backed under the guarantee. Shopping with us is worry-free...guaranteed.